It’s not often that a company asks to have the Occupational Safety and Health Administration (OSHA) visit their facility, but that is exactly what Hoosier Energy did for the Worthington and Lawrence Generating Stations. Voluntary Protection Programs (VPP) is a program from OSHA where companies volunteer to have OSHA inspectors come to their facilities and inspect all safety elements and environmental health aspects every three years. If the certification is achieved, then a facility is marked as a VPP Star Facility. Star facilities submit an annual safety report to VPP administrators and have a physical inspection every three years; only a rare 2 percent receive a five-year certification. Bob VanDenburgh, plant manager for Worthington and Lawrence Generating Stations, feels that he has the right team in place to keep safety a top priority. VanDenburgh and his crew are employees of NAES Corporation, an independent services company dedicated to optimizing the performance of energy facilities. Hoosier Energy has contracted these workers for the generating stations. The generating stations achieved their first VPP status in 2015. Since then, the team did not change any processes but focused on being more efficient with the existing processes. One of these processes is a monthly walk-around with the safety committee to identify and develop solutions for hazards. 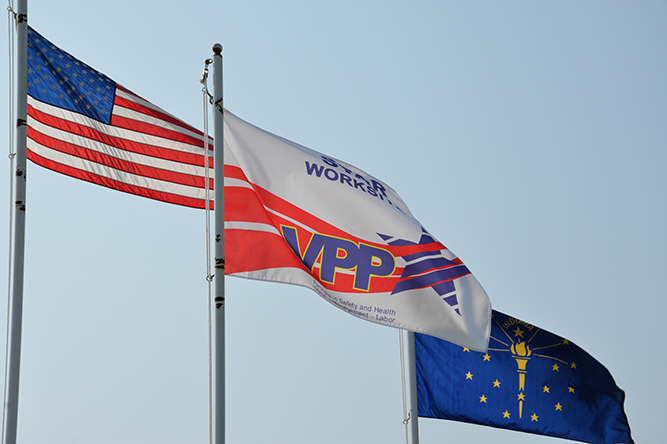 During the latest OSHA review, Travis Gentry, VPP Team Leader, Indiana Department of Labor, was the lead inspector. Gentry was so impressed with the safety improvements made and maintained at these facilities that he submitted a proposal for the stations to be VPP certified for five years, instead of three.